Reposted. Part Three of a three-part article from 2006, written in collaboration with Madeline Gardner. Read Part One here and Part Two here first. Many of us, when we become disillusioned with the dominant culture, we develop an inclination to separate ourselves from it. When we begin to become aware of racism, sexism, capitalism and whatever other forms of social, economic or ecological oppression, we don’t want to be part of it. This often comes from a moral repugnance and a desire to not cooperate with injustice. However, this desire to separate ourselves from injustice can develop into a general mentality of separation from society. In other words, when we see the dominant culture as a perpetrator of injustice, and we see society as the storehouse of the dominant culture, then our desire to separate ourselves from injustice can easily develop into a mentality of separating ourselves from society. With society seen as bad, we begin to look for ways of distinguishing ourselves and our groups from it. We begin to notice, highlight, exaggerate and develop distinctions between ourselves and society, because these distinctions support our justice-oriented narratives. The distinguishing features often go far beyond nonparticipation in those aspects of the dominant culture that we find offensive. We adorn ourselves with distinguishing features to express separation, and also to flag likeminded people and establish ourselves in–and assimilate into–oppositional subcultures. Many such subcultures–consciously or not–prize their own marginalization. If society is unjust, then our justice-oriented narratives are reaffirmed when we are rejected by society (or more accurately, portions of society). If society is bad, then marginalization in society is good. We tell each other stories of how we were ostracized in this or that group, how we’re the outcast in our family, how we were the only revolutionary in a group of reformists, etc. We swim in our own marginalization. This is the story of the righteous few. One of the largest barriers to strategic thought and action in many U.S. social movements today is that, in the story of the righteous few, success itself is suspect. If a group or individual is embraced by a significant enough portion of society, it must be because they are not truly revolutionary or because their message has been “watered down,” rather than because they’ve organized or communicated their message effectively. Here we see the importance of checking our narratives for faulty components. If we allow the story of the righteous few to hold a place in our narratives, then our social change efforts are likely to be greatly hindered by a general mentality to separate and distinguish ourselves from society and to retreat from success. To organize effectively this mentality has to turn 180 degrees to a mentality to connect with others, to notice commonalities, “to weave ourselves into the fabric of society,”3 and to embrace being embraced by society. This is a profound paradigm shift that most radicals have yet to make. It intensely challenges us because it requires nothing short of getting over ourselves. We often make the mistake of assuming that everyone subscribes to the dominant ideology, or even that those who seem to subscribe do so completely. However, a lack of visible resistance to a dominant ideology does not necessarily signify an enthusiastic embracing of the ideology. Submission or acquiescence to a dominant ideology is not the same as ideological alignment. For example, many people, though aware that a new Wal-mart would harm their local economy, may still refrain from participating in a grassroots campaign to stop it. A small turnout for a counter-Wal-mart protest does not necessarily mean that the entire town–or even the majority–is happy about the development. It could be that people lack faith in the feasibility of stopping something as big as Wal-mart, that the tactics or rhetoric of the campaign seem inaccessible or extreme to them, or even that they perceive a lack of strategy in the campaign (among many more possibilities). While each of these possibilities still poses a challenge to organizers, these challenges are of a different type and quality than the challenge of reaching someone who is explicitly pro-Wal-mart. By exploring alternative explanations for lack of participation, organizers can develop better strategies. 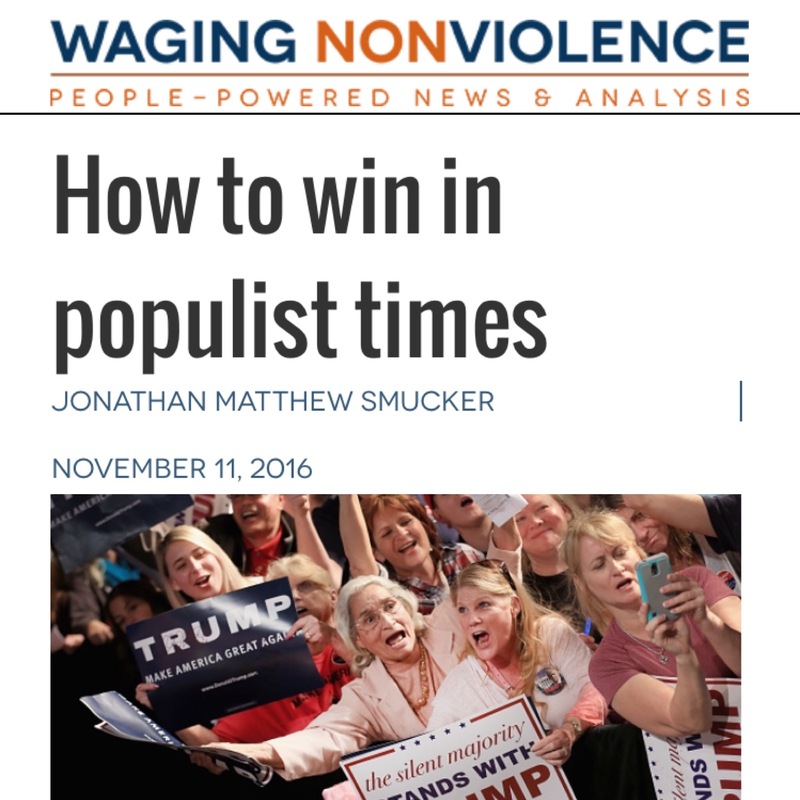 But if organizers see the lack of participation as an inevitable popular embracing of Wal-mart, then they will feel–and likely be–defeated, and if they continue in their resistance, they are likely to be taking a stand more than waging a struggle; consciously or unconsciously adopting the storyline of the righteous few. Social movements should aim to succeed. Fighting an advantaged opponent without the intention of success is not so much fighting as it is coping. The tendency of the outgunned resister to run headlong kamikaze-style into enemy lines is the tendency of someone who wants to be righteous – not of someone who seeks to affect change. We must ask ourselves if our intention is to bring about real change, or if it is to act out righteous narratives (either as individuals or in small enlightened groups). The tendency to think “that all the everyday life of the people is a mere reproduction of the dominant ideology” is detrimental to movement building. We need to shift our mentality to one in which we actively look for forms of resistance to dominant ideologies, however subtle, and encourage these forms. While it is important to recognize the limits of often subtle and uncoordinated expressions of resistance to dominant ideologies, it is equally important to recognize the existence and value of such expressions. By encouraging such expressions we can affirm and therefore strengthen people’s anti-dominant values and identity, which can lead to a broadening of our base. While we challenge the dominant storyline, we must also challenge some components of our own narratives. We must scrap the chapter of the righteous few, and replace it with a story of collective liberation in which, instead of setting ourselves apart, we engage in the hard work of bringing people together. Michael Albert. The Trajectory of Change (Cambridge, MA: South End Press, 2002). Mark Anderson. All the Power (Canada: Punk Planet Books/Akashic Books, 2004). Quoting NY activist Beka Economopoulos. Paulo Freire, Ana Maria Araujo Freire, and Donaldo P. Macedo. The Paulo Freire Reader (New York: Continuum, 1998).